Cadillacs offers a special level of luxury, and an equal level of superior performance and value. Our certified technicians have the knowledge and resources necessary to provide expert Cadillac service and repair in Greenwood, Indiana. 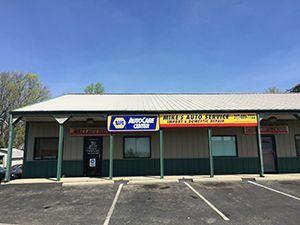 Our clients are highly regarded at Mike’s Auto Service, and we treat every vehicle as if it were our own. Whether you own a Cadillac Eldorado or Cadillac STS, our NAPA® authorized auto care center is fully-equipped to manage any service or repair in a timely fashion. . We offer factory scheduled maintenance, minor repair, major repair, and more. Not only do we offer a wide range of Cadillac repair services, we do so at the most competitive prices in town. And right now, new customers receive a 10% discount! When you need Cadillac service or repair, we are the skilled professionals to trust. Our deep devotion to high-quality service at an affordable price is what sets us apart from our competitors. And our extensive hands-on experience and proficiency in the automotive industry gives us an advantage. We use a focused approach to inspect, diagnose, and service Cadillacs, which ensures we get the job done right the first time around. All this, along with our work ethic and integrity, makes us the preferred choice for Cadillac repair service in Greenwood, IN. Call us today at 317-889-7722 for an estimate, or to schedule an appointment.